Nintendo Labo: VR Kit will hit store shelves on April 12. The fourth entry in the Nintendo Labo series will allow players to create six new Toy-Con controllers out of cardboard (a camera, bird, wind pedal, elephant, blaster, and the VR goggles), and use them to try a variety of virtual reality experiences and games on special Switch software. Ahead of the game’s launch, Nintendo announced that the Toy-Con VR Goggles will also be compatible with two other Switch games, the mega-hits Super Mario Odyssey and The Legend of Zelda: Breath of the Wild. In Super Mario Odyssey, players will be able to visit the Cap, Seaside, and Luncheon Kingdoms to finish three new mini-missions that will ask them to collect coins and music notes. Meanwhile, The Legend of Zelda: Breath of the Wild will allow players to view the beautiful open world of Hyrule in virtual reality. Players will be able to turn the VR mode on an off via a setting in the game’s options menu. Both games will be updated with Nintendo Labo: VR Kit support on April 25. This isn’t the first time one of Nintendo’s games has been updated with Nintendo Labo support. The family-friendly kart racing game Mario Kart 8 Deluxe allows players to race using the motorbike Toy-Con from the Nintendo Labo: Variety Kit and the steering wheel, pedal, and key Toy-Cons from the Nintendo Labo: Vehicle Kit. If you want to try the VR feature in Super Mario Odyssey and The Legend of Zelda: Breath of the Wild, but you’re not sure about purchasing the full Nintendo Labo: VR Kit ($79.99), the Nintendo Labo: VR Kit - Starter Set + Blaster comes with the VR Goggles you’ll need, but at a lower price of $39.99. 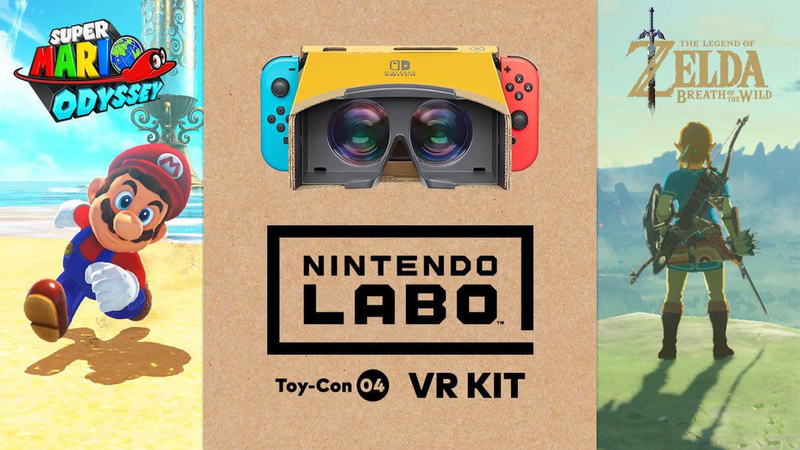 Parents, keep in mind that the VR functionality of the Nintendo Labo: VR Kit is recommended for players 7+. You can turn off the VR feature to allow younger players to enjoy the kit’s experiences in normal 2D. Players also need to hold the goggles up to their face to view the VR content, which could lead to strain if used for too long in a single session. Check out our previous coverage for more information on the Nintendo Labo: VR Kit, and the games and experiences it will allow your family to try.